They float in the wind, get shaken off pets and wildlife, travel the world stuck to luggage or clothes and hitch rides by plane, ship, train, truck and car. Invasive weeds enter backyards in multiple ways and once there can cause havoc. Battling invasive weeds costs Oregon millions of dollars a year. According to the last figures available from a 2014 study commissioned by the Oregon Department of Agriculture, 25 of the state’s most significant invasive weeds cause an estimated annual loss of about $83.5 million and climbing. The cost to homeowners may be negligible in contrast, but the frustration is real. Once plants like Scotch broom, blackberry or horsetail get a footing in the garden, they can be extremely difficult – if not impossible – to eliminate. The first line of defense, Peachey said, is to get familiar with your weeds. Whether they are annual or perennial plants can determine the approach to curbing them. Annuals spread by seed and die when the weather gets cold, but the seed remain viable in the soil for years. Some examples are sharp point fluvellin, velvetleaf, puncturevine, horseweed, western bittercress and oxalis. Perennial weeds thrive year after year with root systems that may be tough to eradicate. They can spread by seed, but some of the more difficult perennials also spread with creeping root systems. These super aggressive weeds include blackberry, Scotch broom, bindweed (also known as invasive morning glory), horsetail, English ivy, poison oak and old man’s beard (also known as traveler’s joy; an invasive species of clematis). Peachey’s advice is to pull anything you don’t recognize and get it identified. Weeds can get a foothold quickly and are easier to manage before they get out of control. You only have to look at natural areas like Forest Park in Portland to see an example of an extremely damaging weed. Get a hand with identification by posting a photo to Ask an Expert, an online Q&A feature from OSU Extension, or taking a photo or fresh sample to your local Extension office. The experts can also help with suggestions on fighting whatever weed is invading your garden. The best hope for controlling annual weeds is pulling and keeping them from going to seed, according to Peachey. Get them out when they are small; late winter is not too soon to start. Since the seed can live in the soil for years you’ll need to be vigilant and keep pulling new seedlings year after year. If you keep pulling as they pop through the soil, eventually, you should get the population under control and have to weed less. Organic mulches such as bark dust, wood chips, leaves, straw and grass clippings keep weeds under control and improve soil as they break down. Apply a layer of organic mulch 2 to 4 inches deep to your garden. Avoid the leaves of black walnut trees (Juglans nigra) or tree of heaven (Ailanthus altissima), which can inhibit growth of plants and seeds. Don’t use lawn clippings if the lawn was mowed when weeds were in seed. If you are trying to keep down perennial weeds, a layer of garden fabric should be placed on the soil before applying mulch. Compost is one of the worst offenders of bringing in weeds to the garden. Get recommendations of compost handlers from friends or neighbors who have had loads without many weed seeds. Ask employees what they do to their compost to avoid weed seeds. Bird seed is notorious for starting weed infestations. Avoid this by buying black oil sunflower seeds, which many birds prefer, or put a tray under the bird feeder to catch any errant seed. Hay can contain many weed seeds. Be cautious when using hay or use straw, which has much of the seeds removed. Plastic sheeting may also be used to control weeds. Black plastic reduces light and prevents weed growth. For vegetable gardens, you will need drip irrigation and appropriate fertilizer in place before you lay the plastic. Make slits in the plastic, and if weeds appear in the planting slits, immediately remove them. For other areas of the garden, pull weeds or kill with Roundup, cover with plastic and leave for six weeks. The weeds will “starve” without sunlight. Sprinklers water a large area but encourage weed growth. Drip irrigation delivers water only where you want it and will slow the number of weeds in the garden. Hand pulling works well in small gardens and raised beds. Pull when the soil is damp, but not wet. Try to get to annual weeds before they go to seed or you’ll get a whole new crop. When you pull perennial weeds, you likely won’t get all of the root system. However, if you persistently remove new weedy shoots, you prevent the plant from storing carbohydrates and may, eventually, kill the perennial plant and win the war. This process is called carbohydrate starvation and must be done with passion almost every day to be successful. But people really can control morning glory and other perennial weeds by this level of commitment. Hoes are a traditional and effective way to weed. Several styles are available. A scuffle hoe is better for larger areas. The hula, or action hoe is a lightweight scuffle hoe. 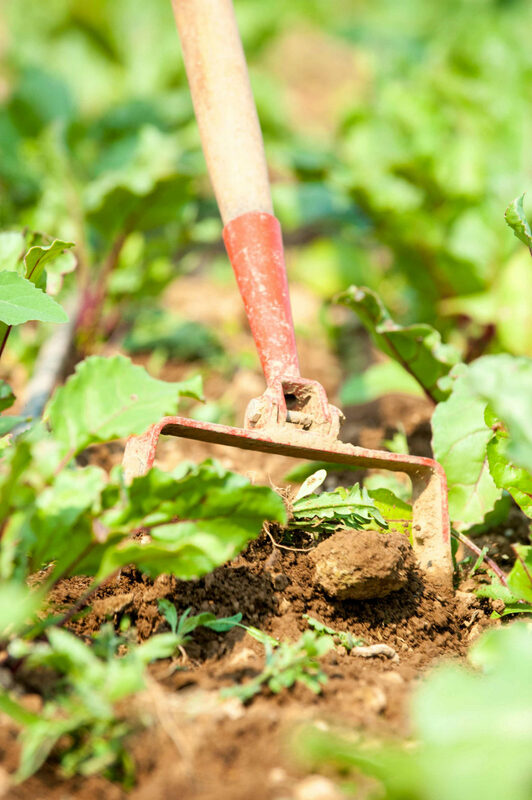 Pushing and pulling it just under the soil surface eliminates newly emerging weeds. It is less effective against well-established weeds. The lightweight Warren hoe has a heart-shaped blade and is useful for cultivating between plants. Small hand cultivators are good for weeding small areas and between closely spaced plants. Another handy tool is the dandelion digger (also known as a weeder, cultivator or asparagus knife). It is a 10- to 14-inch metal rod with a two-pronged blade and works well for digging long taproots. Hori Hori knives are a popular choice for any sort of hand weeding. Herbicides can be used with varying success and should be used judiciously. Choose an herbicide that is registered for the weed you’re trying to kill (it will say on the label). Always follow the directions. Be careful not to allow spray to drift to other plants, many of which are susceptible. Roundup can be productive against annual weeds but is usually not as successful for perennials or shrubs. Crossbow herbicide can be more effective for shrubs such as blackberry and Scotch broom. Dispose of invasive weeds that are in seed by bagging and putting in the garbage bin.